flamingos!!! 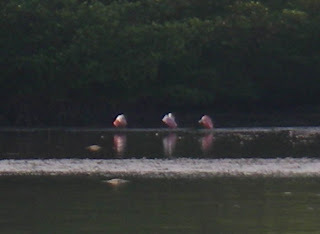 i saw wild flamingos!!! not in a zoo or a cage or stuffed in a hotel lobby just standing around on a shoal bank of the marco river. and you know what? they’re really pink! in a wilderness landscape of a thousand shades of green and brown the flamingos were a brilliant splotch of pink.